As the last helicopter soared out across Naden Harbour on the morning of September 1st we toasted the conclusion of our 24th amazing season! QCL guests enjoyed an excellent summer with decent weather, great fishing and loads of fun! It was our busiest season ever and we had such a great time! Thank you to all who made it up to Haida Gwaii to stay with us this year! We’re looking forward to an even bigger summer next year as we celebrate 25 seasons of sharing awesome fishing adventure and camaraderie with our guests from all over. 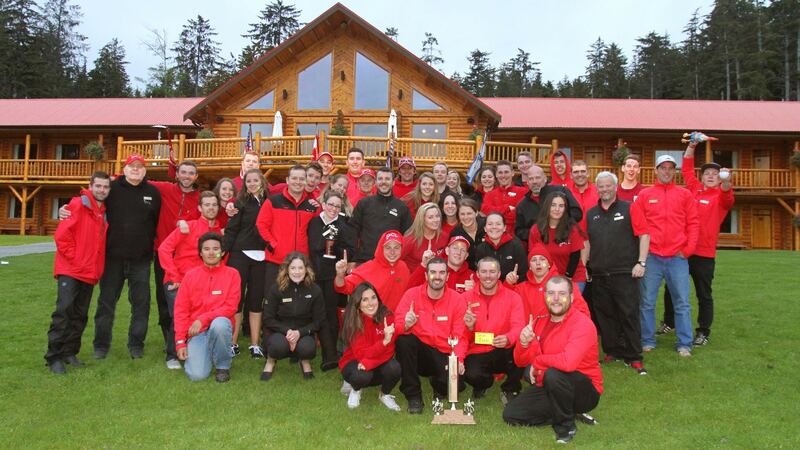 We’re so fortunate to have an amazing staff up at the lodge each season. 2014 was no exception and we owe a great big thank you to all of the 110 members of our QCL team for doing such a fantastic job every day! They truly enjoy what they do! Our team in Vancouver, as always, provides a level of support that any organization would be thrilled to have and we couldn’t succeed without it. Thank you! Fishing this summer was similar to 2013 with huge numbers of Chinooks in the 15-20 pound class providing lots of exciting action day to day. 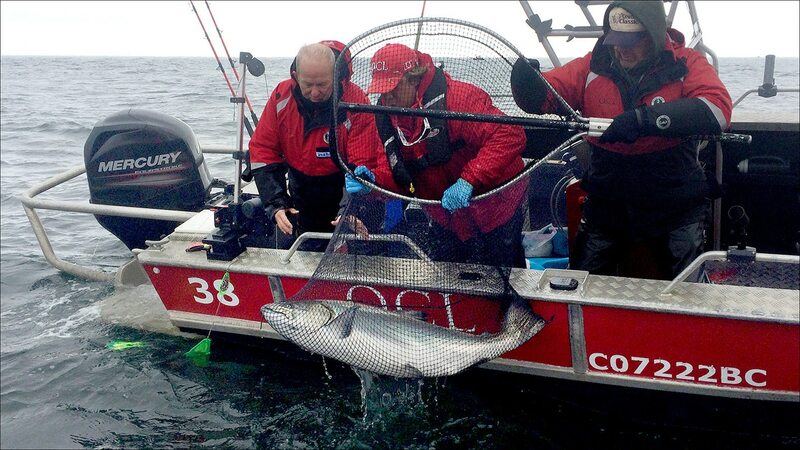 Our Tyee count held steady in 2014 with a slight increase in the number of really big salmon over 40 pounds. The season’s largest Chinook was a handsome chrome giant landed on July 19th by Bruce Severson that taped out to 68 pounds before it was released by his guide Kraig Coulter. Over the past couple of years QCL anglers have really become enthusiastic Halibut fishers. Historically most guests easily picked up a couple of “chickens” to take home, often as bycatch while mooching for salmon. 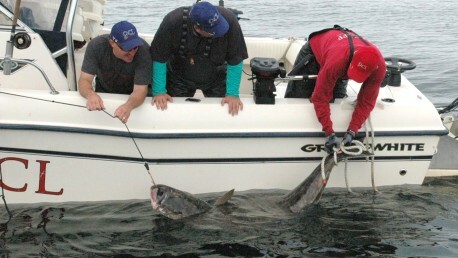 Recently however, guests and guides alike have discovered the thrills and challenges of fishing a little offshore and actually targeting halibut with proper tackle and techniques. Their efforts are paying off. Many guests are going home with halibut in the 20-40 pound class and the number of fish we’ve seen over 60 pounds has soared to more than a hundred! 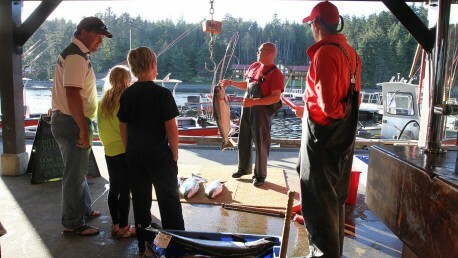 Of course any halibut more than about 70 pounds is released now so guides have developed effective methods to measure them alongside the boat. As a result our trophy Halibut Club for fish over 100 pounds has grown significantly, especially this year! Thirty-six fish taped out to 100 pounds or better in 2014, with Mike Sutherland’s long-standing lodge record of 183 pounds being broken 5 times! In fact, QCL anglers brought four halibut alongside the boat this summer that each would weigh over 200 pounds! The largest of these, at 78 inches in length for a calculated weight of 255 pounds, was a team effort, landed by Donald Walker and Michael Stockton on August 5th. Their guide, Derek Poitras, took great pains to ensure that he had an accurate measurement. 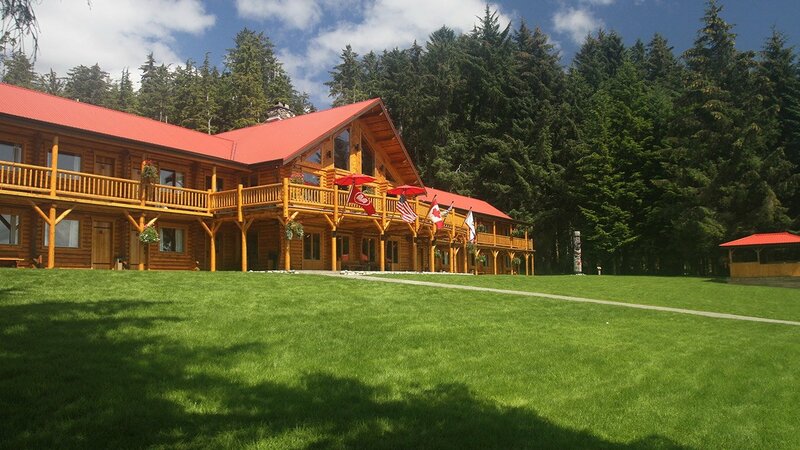 (Derek has some experience at this; he also released the lodge record salmon for his guest Chris Lewis in 2011!) That’s just an amazing catch and it sure gets the imagination going when we know that there are likely even bigger halibut out there! The rigdown crew has completed their giant task and put the lodge and the docks to bed for the winter. The caretakers have their “to-do” lists and many of the staff have returned to school or other jobs, or not! Of course, lots of them are “gone fishing”, enjoying some well-deserved days on the river! And some of us are making plans for next year! Stay tuned!